Completing a thorough risk assessment and identifying any dangers is necessary for companies wanting to ensure that they fully comply with health and safety regulations. Part of your health and safety procedure should be warning anyone on your premises of the presence of hazards. Our overhead hazard signs are a cost-effective way of ensuring that employees and visitors are aware of any hazards from above. After selecting your overhead hazard sign, make sure you securely attach it. We have a range of sign fixings so that you can choose the most appropriate means for affixing your signs, indoors or out. On construction sites overhead hazards are common with employees working on different levels and cranes used to move loads around the site. A head injury in these circumstances could be serious, leading to long-term consequences. Construction sites, however, are not the only place where overhead hazards can be found. For example, low ceilings in a warehouse or on the factory floor where products or equipment are moved overhead can cause a potential hazard. So too can any overhead cables, which can pose a serious threat of electrocution. By using overhead hazard signs in the relevant locations on your site you can make sure that everyone is aware of overhead hazards and can take the necessary action to avoid them or to protect themselves from potential injury. At Seton, we have an extensive range of overhead hazard signs. All feature the hazard triangle with a border that can be easily seen and understood. The symbol inside the triangle can convey information on the hazard, for instance an overhead crane. In addition to the symbol, many of our signs also feature wording to further explain the hazard. With so many variables in different industries there needs to be a number of options for overhead hazard signs. These include materials that are suitable for both indoor and outdoor use. Worn signs may not sufficiently convey the warning message, but our signs are durable, and some include the option of UV resistance so that even in challenging conditions, the hazard warning continues to be clearly displayed. An overhead hazard sign is effective at warning people to keep clear of the area where there is a risk of head injury, but for those who need to be in that area, the sign reminds them to protect themselves. If you have employees or visitors needing to be in an area where there are overhead hazards, make sure they are protected from head injuries. At Seton, we stock a large range of head protection, including hard hats, which are a legal requirement for many workplaces. 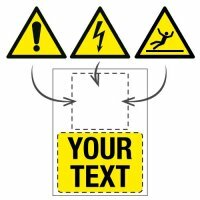 For all other hazard warning signs, take a look at our whole range. Our overhead hazard signs are designed to convey the information required for most work premises; however, all sites are different, and you may have some special requirements not covered by our current range. If so, we can design a custom sign to fit your requirements while still offering you the peace of mind that this sign will comply with current UK and EU health and safety regulations. The use of signs to raise awareness of a hazard is covered by a number of health and safety laws. Displayed appropriately, hazard signs, including overhead hazard signs, are effective at preventing accidents. For anyone concerned by the regulations, get peace of mind by shopping at Seton. 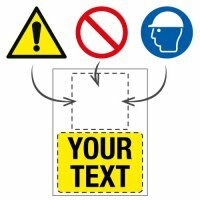 As one of the leading retailers of workplace safety products, we ensure that all of our signs comply with current UK and EU safety laws. Check out other warning signs that we have to offer to ensure that the whole workplace has the appropriate signs.